I recently received an email asking about Addison Crisis. It reads: My sister-in law just was sent to the hospital and came back with a Diagnosis of Addison Disease and was told she had a crisis. What does this mean? 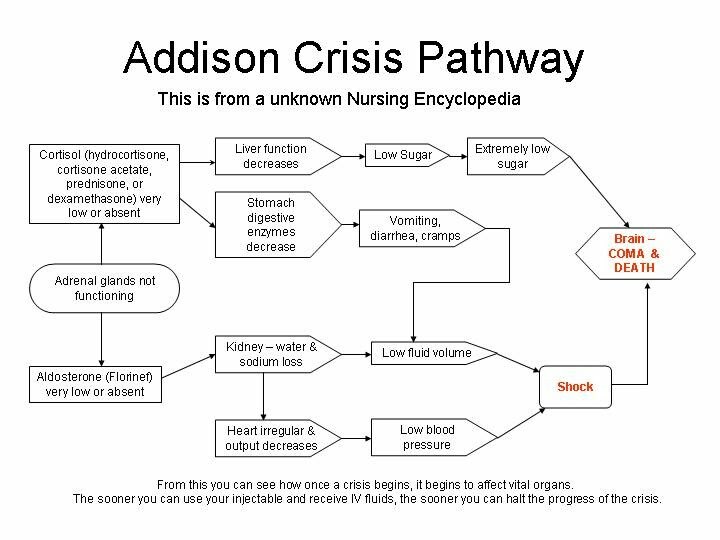 First Question: What is Addison’s Disease? It is a rare condition that affects the Endocrine System. This condition can also be called: Chronic Adrenal Insufficiency. 70-80% of the time, there is an insufficiency of the adrenal hormone called Cortisol. Often the cause is damage from one’s own Immune System. This can be referred to as Primary Adrenal Insufficiency. Tumors can be seen, but this is a rare cause agent. It is really called an Addisonian Crisis. This occurs possibly as the result of an undiagnosed condition or a serious change in adrenal function. This is a medical emergency and potentially life-threatening situation. Hospitalization is often necessary part of this disease. Standard therapy involves injections of hormones. Large volumes of IV fluid including Dextrose. Fluid by mouth is the next treatment when patient becomes more stable. Click on the picture to get a better view!